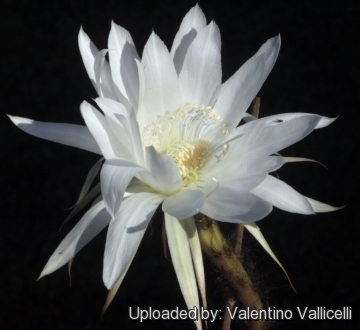 Origin and Habitat: Echinopsis silvestrii is endemic to northwestern Argentina, where it occurs in Salta and Tucumán, it has a relatively small range (Extent of Occurrence estimated to be 6,000km2), it is severely fragmented, and the population is decreasing due to land use change. Altitude range: It grows at elevations of 750 to 1,600 metres above sea level. Habitat and Ecology: This cactus grows in thorn forest. It is locally abundant, but the population is decreasing. The species is affected by agro-industrial ranching and agriculture. 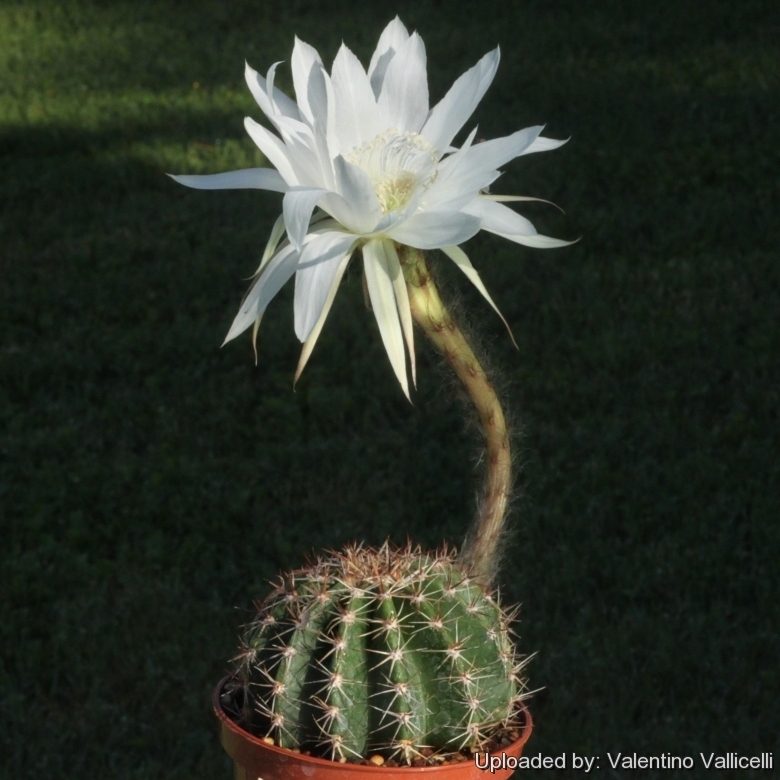 Description: Echinopsis silvestrii is known for having gorgeous, white flowers at the ends of long tubes often as large or larger than the whole plant. The flower are scentless. 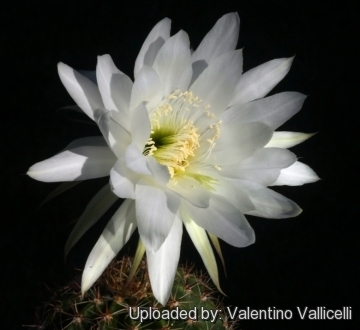 It should not be confused with Echinopsis chamaecereus, formerly known as Chamaecereus silvestrii. Habit: Plants mostly solitary, sometimes branching to form small clumps. Stems: Globose to short cylindrical, 5-10 cm high, 4-8 cm in diameter. Spines. Rather stout and short; greyish. Radial spines: 5-9, flattened against the stem surface. Flowers: White, not fragrant, to 20 cm long, inner perianth-segments obtuse, white; style white; stigma-lobes 9, white. 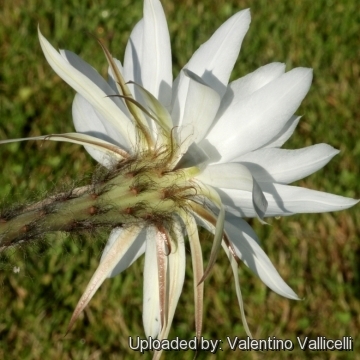 Note: Echinopsis silvestrii is poorly known and sometime synonymized with Echinopsis albispinosa K. Schumann 1903. Cultivation and Propagation: Echinopsis silvestrii is extremely resistant to cultivation errors. The only thing that can kill this plant is cold. Nevertheless, it is appropriate to provide adequate growing conditions in order to obtain abundant blooms. It has very large fragrant nocturnal flowers and many plant lovers are willing to take care of it all year for one or a few magical nights with exotic charm. Growth rate: It is a relatively rapidly growing species that will make large clumps given the best conditions. Soils: It likes very porous standard cactus mix soil, but it is extremely adaptable to various growing media. Prefer a low pH compost, avoid substrata rich in limestone. Watering: Needs moderate to copious waterings in summer (it is more demanding than other cactus), but do not overwater, keep dry in winter at a minimum temperature of 0°C. Hardiness: Reputedly resistant to light frost if kept on the dry side prior to, and during, cold weather (hardy to -5 C ° C, or less for short periods). However warmth throughout the year will increase the grower's success (5°-8° C during rest season). Exposition: The plant tolerates bright situations which encourages flowering and heavy spine production, but is likely to suffer from sun scorch or stunted growth if over exposed to direct sunlight during the hottest part of the day in summer. It grows well with filtered sunlight or afternoon shade. Uses: It is an excellent plant for container growing. It look fine in a cold greenhouse and frame or outdoor in a rockery. - Rot: This species is particularly easy and accommodating, seldom suffer of cryptogamic diseases. Rot it is only a minor problem with Echinopsis if the plants are watered and “aired” correctly. Propagation: Division of larger clumps, direct sow after last frost. Seeds germinate in 7-14 days at 21-27° C in spring, remove gradually the glass cover as soon the plants will be well rooted (ca 1-2 weeks) and keep ventilated, no full sun for young plants! To make a cutting twist off a branch and permit it to dry out a couple of weeks, lay it on the soil and insert the stem end partially into the soil. Try to keep the cutting somewhat upright so that the roots are able to grow downward.